Scottish Death Metal bruisers Scordatura have spent years crafting their sound to reach the perfect, bludgeoning experience which was unleashed on the world in February 2013 in the form of their debut album 'Torment of The Weak'. Having formed the band in 2007 at ages 15-16 they have gone on to play all over the UK supporting the likes of Nile, Cryptopsy, Misery Index, Aborted, Beneath The Massacre, Malevolent Creation & many more as well as touring with Cerebral Bore in 2011 and four self booked tours in across UK & Europe in 2009 / 2010 & 2014. Having just recently performed at Bloodstock Open Air 2014 and Berlin Deathfest 2014 and completing a debut self booked European tour, Scordatura are now planning more shows throughout the UK and Europe in 2015 in support of two new tracks being released from the second album in the months to come. 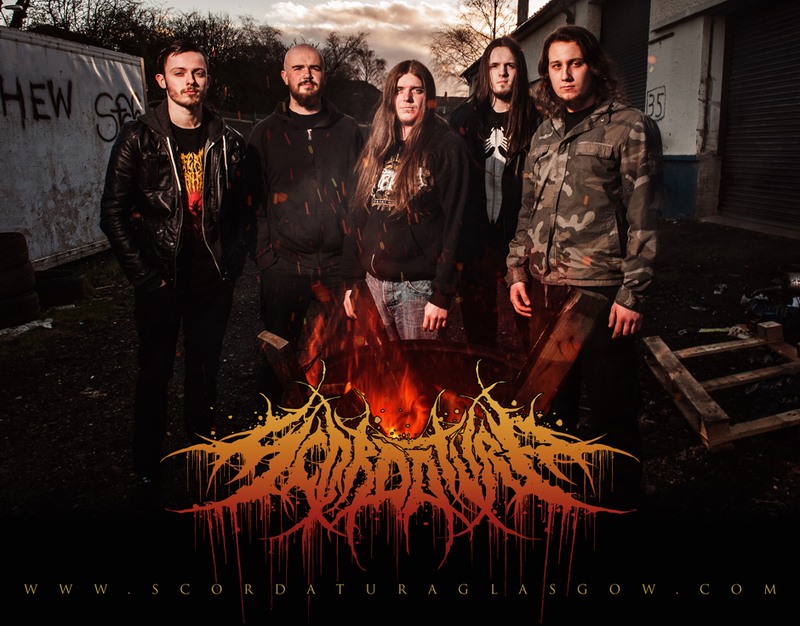 Scordatura are set to show the underground metal scene that Scottish Death Metal is one of the strongest in the business right now! The bands debut album 'Torment of The Weak' features eight blistering tracks of pure Death Metal which has received acclaim from fans, bands and labels alike. Recorded in 2012, mixed by Scott Fuller of Abysmal Dawn and mastered by Fuller and Max Karon. The album is set to drive Scordatura into the forefront of the UK death metal scene with distribution throughout North America and Canada by Blast Head Records. 'Torment of the Weak' is also currently stocked with many labels such as Century Media, Sevared Records, Comatose Music, Amputated Vein Records and many more and features guest vocals by Hideous Divinity vocalist Enrico Di Lorenzo.